meat grinder. It is a tool that helps you in kitchen to make your mincing and chopping easy and effective! Different types of meat like mutton, beef, chicken and fish can be easily ground with the help of manual meat grinder. 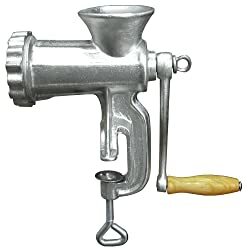 How does a manual meat grinder work ? This machine does not have any complicated systems. It can easily be opened and the internal system can be seen. At the top, there is a funnel. Meat is put into this funnel. Next comes the conveying screw. It directs the meat forward. When the handle is rotated, the meat is directed forward. It gets cut finely with a knife attached next to the conveying screw. Next to the knife is a fixed mincing screen. The pieces of meat get a push as the handle is rotated and comes out in minced form from the holes of the mincing screen. Tip: Make sure that the meat you need minced is free of any extra fats so that it does not block the machine and interrupt the process. Do you use a knife for chopping meat? It must be taking ages chopping a few pounds of meat! Why not try a meat grinder and save time and energy? All those pounds of meats which take hours to be chopped with knife will be finely chopped with the help of meat grinder in one go! 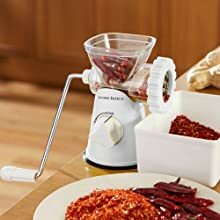 Although iron body meat grinders are heavy in weight and cannot be carried easily but they can be used with ease by getting them fitted on some wooden table. Put the wooden table in a fixed place, take your meat bowl there, get your meat ground and here you go! Thus you do not have to hold it to keep it stable. You can read my reviews about best iron body meat grinder by click here LEM product # 10 stainless steel clamp-on hand Grinder. Plastic body meat grinders are light weight. They can easily be carried. There is no risk of getting rust on them and are easy to clean. Plastic meat grinders with a permanent mount base or suction cup feet allow for easy mounting to a countertop. If you don’t want to spend a lot of money, manual meat grinders are a perfect option for you. They are not very expensive like electric meat grinders so you can easily purchase one. Want to exercise your body a bit ? Exercise is good for health. A wise proverb says ‘No pain no gain!’ And what do you gain with a manual meat grinder is that you only have to put in a little effort. In return, you not only get your meat ground but it also helps you exercise your hands, arms and shoulders! 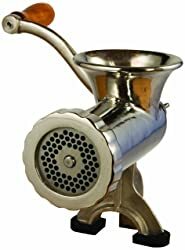 Despite the invention of electric meat grinders, manual meat grinders with easy-to-use specifications are still in use at a large scale. Many people prefer them over other media of chopping meat. Specially, when your budget does not allow you to purchase an electric meat grinder, go for a manual one. It will help you grind meat easily and a healthy looking bicep and triceps too!